Hypuz offers automatic soap dispensers along with unique design, stylish looks and various features at wholesale prices. Such automatic dispensers are also known as liquid hand wash or electric and sensor soap dispensers. We provide best quality hygiene products and sanitizer which are normally used in public restrooms of malls, banquet halls, hospitals, offices and cinema halls. This electric dispensing devices are low power consumption and sensor function gives touch-free operating which make it completely hygienic and worthy. 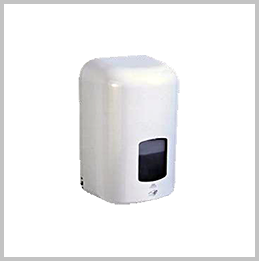 Hypuz is well-known manufacturer, wholesaler and supplier of automatic soap dispensers from Mumbai across India. Functional Features: Use of ABS Plastic material with a new European style design and layout, a Wall Split installation with different hand wash liquid soaps. Liquid pores out easily even with the gentle press. It is very easy and convenient to use and also economically affordable. Liquid container with security lock.